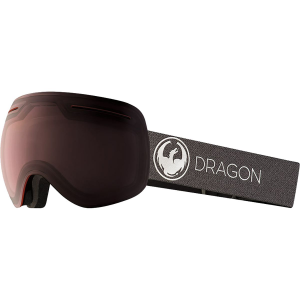 Why bring a quiver of lenses to the mountain when you can handle everything the day throws your way with the Dragon X1 Photochromic Goggles' Its Transitions lens automatically adjusts tint in response to changing light conditions, so you're not caught off-guard when a sunny day suddenly gives way to a socked-in snowstorm. It also features the uninterrupted view of Infinity Lens technology so you can spot your line perfectly and steer clear of out-of-control tourists, and a Super Anti-Fog coating keeps condensation away on the soggiest powder days. Proposition 65 Warning for California Consumers: This product contains chemicals known to the State of California to cause cancer and/or birth defects or other reproductive harm.